Cruising is on the crest of a wave as a record number of people explore the four corners of the world from the comfort of a cruise or river ship. With the fourth National Cruise Week just around the corner (18-25 September), why not join the 1.7m people predicted to cruise in 2011 and get onboard! UK travel agents up and down the country, accredited to the Association of Cruise Experts (ACE), will be hosting events and featuring special offers. There will also be a number of ships in port around the coast – P&O Arcadia, P&O Aurora, P&O Azura, Grand Princess and Holland America Line’s MS Rotterdam. More people than ever before are choosing to cruise. Latest figures from the Passenger Shipping Association (PSA) show that one in every nine package holidays is now a cruise – proving that both the high seas and the slow rivers offer a wonderful holiday for everyone, no matter what the age. There will be ten new ship launches in 2011, from ultra luxury through to ships that offer everything for families. National Cruise Week highlights the huge variety in the style of cruising and the destinations – so there’s never been a better time to set sail. Seven Seas Navigator is an “interesting” ship from an equally “interesting” cruise operator. Her hull was originally built back in the last century in St Petersburg as a research vessel, but soon after coming into service was purchased by the then Radisson Seven Seas cruise line, her accommodation and superstructure being extensively modified by the renowned Italian shipbuilder Mariotti. The 28,000 ton 530-passenger ship is now a 6-star “classic”, somewhat dated in parts, but clearly loved by her regular cliental. It is an “all inclusive” package, with gratuities taken care of, an open bar, plus a fine selection of wines at meal times. For connoisseurs the ship offers a very interesting cellar, but that you have to pay for. We joined Navigator in Seward, the port of Anchorage, Alaska, having flown up from Vancouver which would also be our destination. As experienced ‘cruisers’ of quality taste, we take an interest in the product and what it offers. To date Crystal has satisfied us well, changing only because the Regent itinerary fitted in with our plans. We had been recommended. Regent Seven Seas is an up-market cruise line, now owned by Apollo Management, the investment group who also control Oceania Cruises and 50% of Norwegian Cruise Line. Carlson retains ownership of the master Regent brand, along with the operations of Regent Hotels & Resorts around the world. Seven Seas sister ships are Mariner and Voyager, both 20th century purpose-built, and just like Navigator, featuring only outside cabins. Navigator has 196 balcony suites, the balance of 49 cabins with just a view. The Regent package started from the moment we were collected at Anchorage International Airport, which was last visited courtesy BOAC on the way to Japan. That was how the early 747s routed. In the heart of downtown, the Hilton Anchorage hotel is convenient and comfortable. It has an indoor heated swimming pool and spa. The hotel is only a few blocks from the Alaska Museum of History and Art, 5th Avenue Mall and a host of restaurants. Our room had a magnificent view of the Chugach Mountain Range. Lunchtime the next day and on to the Alaska Railroad for a four-hour journey to Seward. There were probably 200 other Regent guests on the trip, the alternative a coach ride, probably just as interesting but without the special charisma that the train offers. A local guide was provided for each carriage as was catering. Staff from Navigator were also on board with a check-in service. At the port it was straight off the train and onto the ship. Nothing could be easier. 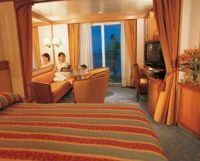 The cruise itself is best described as “The Inside Passage” and takes seven nights. From Seward southward and on to the amazing Hubbard Glacier, then Sitka (where in 1867 Russia sold Alaska to the USA), the Tracy Arm Fiord, Juneau (30, 000 population and the capital of Alaska), tiny Skagway, Ketchikan "Salmon Capital of the World" and finally a day at sea before arriving back at Vancouver. The Regent package includes a number of off-ship tours but we added trips on a floatplane and a helicopter glacier ride. They say that first impressions count and how nice to be welcomed onto the ship with a glass of quality Champagne. We booked late, our penthouse suite the same size (301 sq ft) as the so-called deluxe and standard non-balcony window cabins. The services of a butler were available in this grade but essentially the offering was the same as the less expensive accommodation. A full size tub (as they say in the US) in a marble fitted bathroom, a well filled bar and refrigerator plus a curtained off lounge area where up to six people could dine privately. The balcony was more than adequate. The ship itself is a nice size and was full with about 500 passengers. The single largish swimming pool coped well and there was never a queue to get into the pair of hot tubs. The Canyon Ranch Spa Club, sauna, steam room and gym are over the bow on the very top deck but all the other public areas are towards the stern, which makes it easy to remember where everything is and not too far to walk. We try to use the stairs, both ways, rather than the elevators. 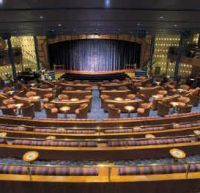 If the ship does have a weakness it is the shows and entertainment, not as lavish as others but still a fine diversion in the evenings from the Casino. The theatre is two-tier and offers a nine-piece live band. When it comes to dining it is all very relaxed. No formal nights, the dress code every evening “Elegant Casual”. 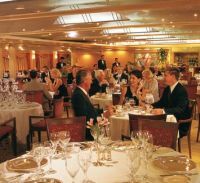 You can dine as a couple, or with up to eight in one of three eateries, La Veranda for breakfast and al Fresco, Compass Rose in the heart of the ship and Prime 7, reservations only but no supplement required, for prime steaks, fish and seafood. Cabin service is provided 24 hours, and during restaurant hours a full menu is offered. Speciality coffees, teas, juices and cocktails are all included. And the pastries were not bad either. For the most part the clientele was American with a sprinkling of Brits, colonials and Europeans. A more friendly crowd you could not wish for. It is a quiet intimate ship. There were a few children in early July but we gather that the number grows during the school holiday period. There is a wonderful afternoon tea, a Bridge school, late night cabaret and for the smokers the Connoisseurs’ Club. Complimentary self-service launderettes are available on four accommodation decks. There were some fascinating art lectures and if you are interested you will be an expert on salmon by the final docking. PROGRAMME: Navigator completes its Alaska summer season in San Francisco on 12 September and departs on a 21-day meander, via the Panama Canal, to New York. It is then to Montreal and south to Ft Lauderdale, its home for a series of mainly 7/10-day cruises around the Caribbean. At the middle of April it is back through the canal again towards its summer home port of Vancouver. Next year Seven Seas Voyager will sail 11 itineraries across the Mediterranean and 12 voyages around Northern Europe providing more options to sail with Regent in these regions than ever before. Mariner offers the best of the east and western Mediterranean’s most popular ports of call with a series of 7, 10, 14 and 16-night itineraries, many of which include overnights in Barcelona, Monte Carlo, Istanbul, Tel Aviv and Venice. Included are 12 new ports of call – Akureyri (Iceland), Cannes (France), Douglas (Isle of Man), Eilat (Israel), Isafjordur (Iceland), Kavala (Greece), Patmos (Greece), Lerwick (Scotland), Lorient (France), Ronne (Denmark), Saint-Malo (France) and Sinop (Turkey). Carnival Magic is the latest and greatest of the Miami-based cruise lines family-orientated fun ships and comes in at 128,251 tons and 3,646/4,631 passengers. From now until the end of October she is embarking on a series of 9- and 12-day cruises out of Barcelona to either Rome or Venice. Crystal Cruises is after the market for those who can’t be away from home (or the office) for too long. Following its introduction of three- and four-night sampler cruises it has added a further three shorter voyages for this autumn. These new six- and seven-night Mediterranean voyages onboard Crystal Serenity are high in port content and value but low in hassle and cost, and feature some of Europe’s most fascinating ports. Europcar has introduced a new rental car cruise terminal a Southampton. Essentially it is a meet and greet service, ensuring their car is ready and waiting when they hit dry land. Gills Cruise Centre has gone into administration, its assets purchased by travel experts P&P Associates. No client has lost their money or a holiday, although a large proportion of the staff are thought to have been made redundant. At its peak it was the third largest player in the UK cruise market, generating annual sales of £110m and employing some 200 members of staff across two call centres and a retail outlet in Cardiff and London. It was forced to cease trading after cruise lines stopped taking bookings because of concerns over escalating debts in an increasingly competitive market. It was said to be selling cruises below cost in order to retain business. Hapag Lloyd has come up with a ‘Baby Welcome Package’. Clearly the cruise line believes that there is no harm in starting them young. 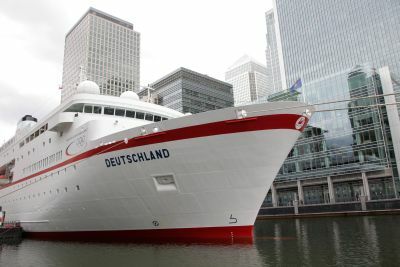 The Hamburg-based cruise operator is taking into account the constantly rising proportion of families on its voyages. The package includes care products such as nappies and washing lotion, changing mats for the cruise and bibs. Every family can compile their personal Baby Welcome Package prior to the beginning of the cruise. By filling in a form, they can simply order items like nappies in the required size and quantity as well as the desired type of baby food, if preferred organically grown. The suite will also be furnished as requested, for instance with a babyphone, Maxi-Cosi, baby travel cot, high chair or bathtub for babies. On the ‘Europa’ children, up to three years of age sharing a cabin with their (grand)parents, travel at no cost; children aged four to 15 are charged €65 per night. Oceania Cruises celebrated a major milestone on Saturday 16 July, as the company’s new 1,250-guest luxury cruise ship Riviera was afloat for the first time at Italy’s Fincantieri shipbuilding yard. 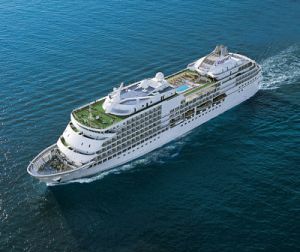 “The float out of a ship is a beautiful occasion which marks the beginning of her life and we are eagerly anticipating the day next spring that we can unveil her to the world,” stated Frank Del Rio, Chairman and CEO of Prestige Cruise Holdings, parent company of Oceania (and Regent) Cruises. Voyages to Antiquity has revised its programme for November 2011 due to the continuing difficulties in Libya and Syria. The 8 November departure – now called Ancient Wonders and the Holy Land – will feature a two-day excursion to Jerusalem and Bethlehem with the chance of a dip in the Dead Sea. 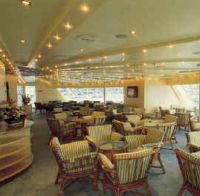 The final cruise of the 2011 season – now renamed The Red Sea, Petra and Suez Canal – will depart on 19 November, and feature a pre-cruise stay of two nights in Amman, the Jordanian capital, plus a night in the ancient, rose-red city of Petra, staying in 5-star hotels. Wine Lovers might find a river cruise organised by Travelzest’s VFB Holidays departing 14 October just to their taste. Accompanied by a Meilleur Sommelier de France, the wine production process is brought to life. Enjoy tastings in all the key regions including Côte de Beaune, Beaujolais, Vivarais, Châteauneuf-du-Pape and Cassis.